The sixth book in the collection known as "The Twelve Minor Prophets"; it is ascribed to Micah the Morasthite (see Micah No. 1). It consists of seven chapters, the contents of which are as follows: Ch. i.: The idolatry of Samaria and Jerusalem are denounced; the prophet laments their fall and exhorts, the people to mourning. Ch. ii. : Denunciation of oppression; prediction of the punishment of the people therefor; the restoration of Israel foretold. Ch. iii. : The prophet reproves first the princes for their cruelty, then the false prophets, who are the cause of all the evil. He again reproves the princes for their oppression, which, he says, will cause the ruin of Jerusalem. Ch. iv. : In poetical language the restoration of Jerusalem and of the glory of the house of the Lord and the victory of Israel over the other nations are foretold. Ch. v.: Prediction that a powerful king of Judah will vanquish the other nations, particularly Ashur, and will destroyidolatry. Ch. vi. : Israel is reproved for its sins, particularly its injustice; its punishment is prophesied. Ch. vii. : The lack of righteous men and the corruption of Israel are lamented; the prophet comforts Israel, promising that it will be restored to its land and will triumph over its enemies. With regard to the period of Micah's activity, it has been remarked under Micah (No. 1) that there is a difference between the superscription of the Book of Micah, where it is said that Micah began his prophetical career in the days of Jotham, and Jer. xxvi. 18, where his prophecies are confined to Hezekiah's reign. But a closer examination of the prophecies themselves may lead to the acceptance of a period between the two; for it is evident from Mic. i. 2 et seq. that Micah prophesied before the fall of Samaria, which, contrary to II Kings xviii. 10, took place under the reign of Ahaz, as may be inferred from a comparison between II Kings xviii. 13 and the cuneiform inscriptions (see Hezekiah, Critical View). 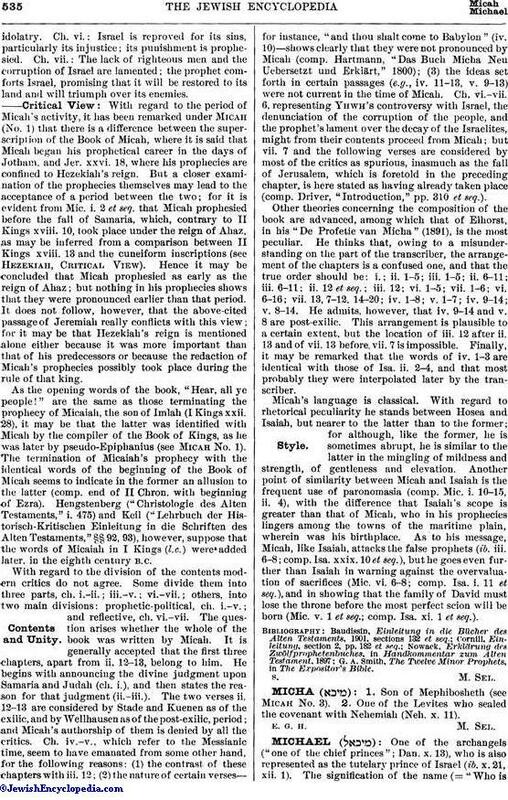 Hence it may be concluded that Micah prophesied as early as the reign of Ahaz; but nothing in his prophecies shows that they were pronounced earlier than that period. 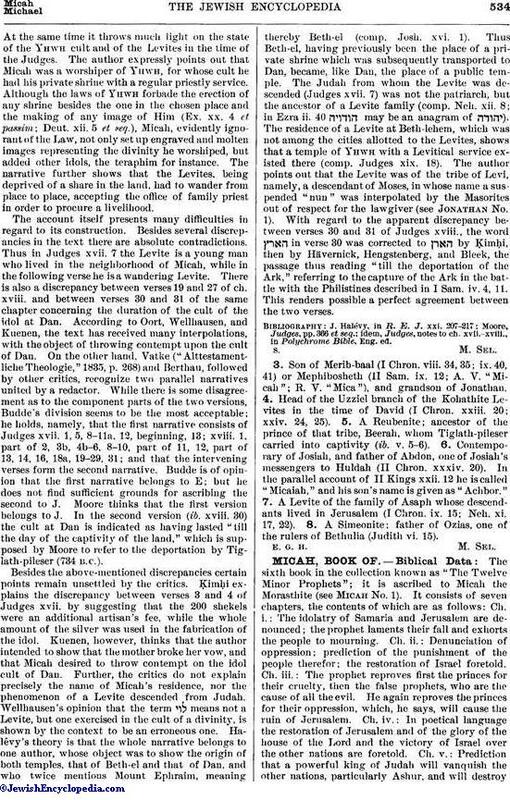 It does not follow, however, that the above-cited passage of Jeremiah really conflicts with this view; for it may be that Hezekiah's reign is mentioned alone either because it was more important than that of his predecessors or because the redaction of Micah's prophecies possibly took place during the rule of that king. As the opening words of the book, "Hear, all ye people!" are the same as those terminating the prophecy of Micaiah, the son of Imlah (I Kings xxii. 28), it may be that the latter was identified with Micah by the compiler of the Book of Kings, as he was later by pseudo-Epiphanius (see Micah No. 1). The termination of Micaiah's prophecy with the identical words of the beginning of the Book of Micah seems to indicate in the former an allusion to the latter (comp. end of II Chron. with beginning of Ezra). Hengstenberg ("Christologic des Alten Testaments," i. 475) and Keil ("Lehrbuch der Historisch-Kritischen Einleitung in die Schriften des Alten Testaments," §§ 92, 93), however, suppose that the words of Micaiah in I Kings (l.c.) were added later, in the eighth century B.C. With regard to the division of the contents modern critics do not agree. Some divide them into three parts, ch. i.-ii. ; iii.-v.; vi-vii. ; others, into two main divisions: prophetic-political, ch. i-v.; and reflective, ch. vi-vii. The question arises whether the whole of the book was written by Micah. It is generally accepted that the first three chapters, apart from ii. 12-13, belong to him. He begins with announcing the divine judgment upon Samaria and Judah (ch. i. ), and then states the reason for that judgment (ii.-iii). The two verses ii. 12-13 are considered by Stade and Kuenen as of the exilic, and by Wellhausen as of the post-exilic, period; and Micah's authorship of them is denied by all the critics. Ch. iv.-v., which refer to the Messianic time, seem to have emanated from some other hand, for the following reasons: (1) the contrast of these chapters with iii. 12; (2) the nature of certain verses—for instance, "and thou shalt come to Babylon" (iv. 10)—shows clearly that they were not pronounced by Micah (comp. Hartmann, "Das Buch Micha Neu Uebersetzt und Erklärt," 1800); (3) the ideas set forth in certain passages (e.g., iv. 11-13, v. 9-13) were not current in the time of Micah. Ch. vi.-vii. 6 representing Yhwh's controversy with Israel, the denunciation of the corruption of the people, and the prophet's lament over the decay of the Israelites, might from their contents proceed from Micah; but vii. 7 and the following verses are considered by most of the critics as spurious, inasmuch as the fall of Jerusalem, which is foretold in the preceding chapter, is here stated as having already taken place (comp. Driver, "Introduction," pp. 310 et seq.). Other theories concerning the composition of the book are advanced, among which that of Elhorst, in his "De Profetie van Micha" (1891), is the most peculiar. He thinks that, owing to a misunderstanding on the part of the transcriber, the arrangement of the chapters is a confused one, and that the true order should be: i.; ii. 1-5; iii. 1-5; ii. 6-11; iii. 6-11; ii. 12 et seq. ; iii. 12; vi. 1-5; vii. 1-6; vi. 6-16; vii. 13, 7-12, 14-20; iv. 1-8; v. 1-7; iv. 9-14; v. 8-14. He admits, however, that iv. 9-14 and v. 8 are post-exilic. This arrangement is plausible to a certain extent, but the location of iii. 12 after ii. 13 and of vii. 13 before vii. 7 is impossible. Finally, it may be remarked that the words of iv. 1-3 are identical with those of Isa. ii. 2-4, and that most probably they were interpolated later by the transcriber. Micah's language is classical. With regard to rhetorical peculiarity he stands between Hosea and Isaiah, but nearer to the latter than to the former; for although, like the former, he is sometimes abrupt, he is similar to the latter in the mingling of mildness and strength, of gentleness and elevation. Another point of similarity between Micah and Isaiah is the frequent use of paronomasia (comp. Mic. i. 10-15, ii. 4), with the difference that Isaiah's scope is greater than that of Micah, who in his prophecies lingers among the towns of the maritime plain, wherein was his birthplace. As to his message, Micah, like Isaiah, attacks the false prophets (ib. iii. 6-8; comp. Isa. xxix. 10 et seq. ), but he goes even further than Isaiah in warning against the overvaluation of sacrifices (Mic. vi. 6-8; comp. Isa. i. 11 et seq. ), and in showing that the family of David must lose the throne before the most perfect scion will be born (Mic. v. 1 et seq. ; comp. Isa. xi. 1 et seq.). G. A. Smith, The Twelve Minor Prophets, in The Expositor's Bible.